Harris, D. M., & Bush, J. W. (2015). Generating uniaxial vibration with an electrodynamic shaker and external air bearing. Journal of Sound and Vibration,334, 255-269. Electrodynamic shakers are widely used in experimental investigations of vibrated fluids and granular materials. However, they are plagued by undesirable internal resonances that can significantly impact the quality of vibration. In this work, we measure the performance of a typical shaker and characterize the influence that a payload has on its performance. 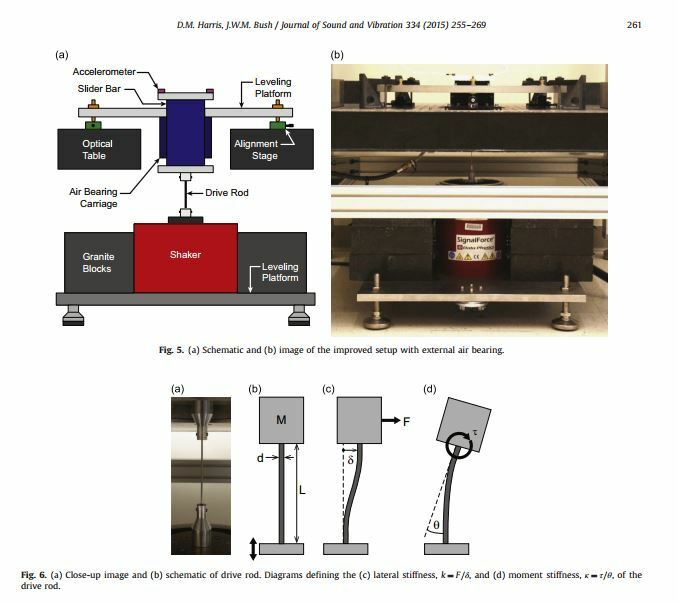 We present the details of an improved vibration system based on a concept developed by Goldman (2002)  which consists of a typical electrodynamic shaker with an external linear air bearing to more effectively constrain the vibration to a single axis. The principal components and design criteria for such a system are discussed. Measurements characterizing the performance of the system demonstrate considerable improvement over the unmodified test shaker. In particular, the maximum inhomogeneity of the vertical vibration amplitude is reduced from approximately 10 percent to 0.1 percent; moreover, transverse vibrations were effectively eliminated. Thank you for giving out the greatest blogs them very nice and very helpful to us. I am very overcome with your site and also with your information on this topic.